Prison interview •He discusses his current loss of freedom and his aim to be an activist-minister. Brandon Loomis | The Salt Lake Tribune (4/26/12) The minimum-security prison camp at Herlong, Calif., with bunks housing about 130 inmates in the building at left, is temporary home to Salt Lake City environmental activist Tim DeChristopher, who disrupted a federal Bureau of Land Management oil and gas lease sale by bidding on land tracts. 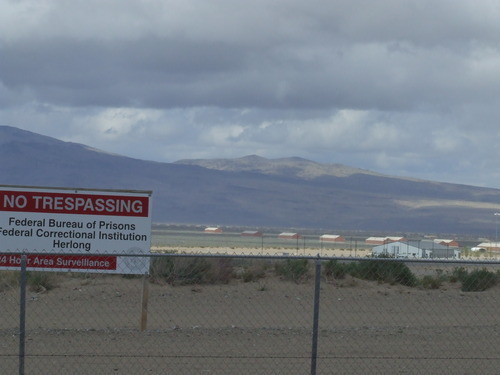 He is serving a two-year sentence at the camp northwest of Reno, Nev., and has routine access to short walks on the desert around the complex. Chris Detrick | The Salt Lake Tribune Tim DeChristopher arrives at the Federal Courthouse for his sentencing Tuesday July 26, 2011. U.S. District Judge Dee Benson sentenced him to two years in prison. Steve Griffin | The Salt Lake Tribune Tim DeCristopher talks with members of the media in 2008 after he was escorted out of the BLM offices in Salt Lake City following his bid on several oil and gas leases during a BLM auction. His bidding drove up the prices of several auctions and he won an estimated $1.8 million worth of leases. He has no intention of paying for the leases and said it was a way for him to protest the auction. 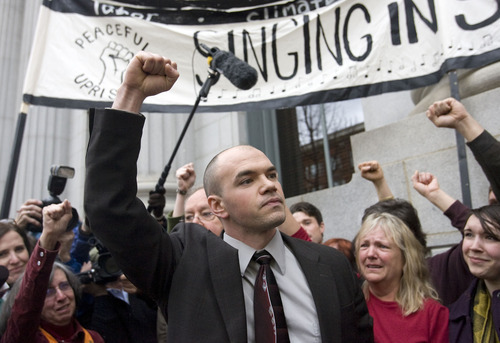 AL HARTMANN | Tribune File Photo An undaunted and defiant Tim DeChristopher rallies his supporters after being found guilty of crashing a federal oil and gas lease auction outside the Frank Moss Federal Courthouse in Salt Lake City March 3. 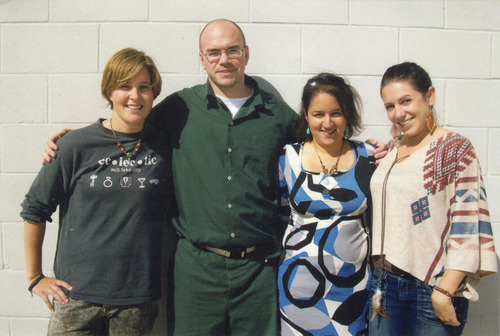 From left to right: Lauren Wood, TIm DeChristopher, Henia Belalia and Dylan Rose Scheider. Friends and Peaceful Uprising activists visit convicted oil and gas lease monkeywrencher Tim DeChristopher where he's held at the minimum-security federal prison camp at Herlong, Calif. courtesy of Peaceful Uprising Brandon Loomis | The Salt Lake Tribune (4/26/12) The minimum-security prison camp at Herlong, Calif., with bunks housing about 130 inmates in the building at right, is temporary home to Salt Lake City environmental activist Tim DeChristopher, who disrupted a federal Bureau of Land Management oil and gas lease sale by bidding on land tracts. 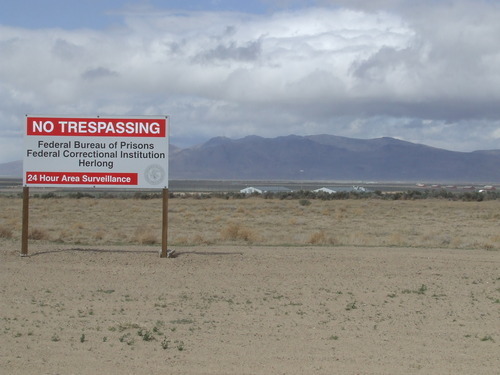 He is serving a two-year sentence at the camp northwest of Reno, Nev., and has routine access to short walks on the desert around the complex. Brandon Loomis | The Salt Lake Tribune (4/26/12) The minimum-security prison camp at Herlong, Calif., with bunks housing about 130 inmates in the building at left, is temporary home to Salt Lake City environmental activist Tim DeChristopher, who disrupted a federal Bureau of Land Management oil and gas lease sale by bidding on land tracts. 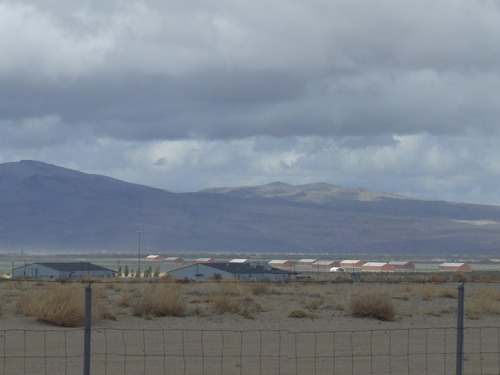 He is serving a two-year sentence at the camp northwest of Reno, Nev., and has routine access to short walks on the desert around the complex. Brandon Loomis | The Salt Lake Tribune (4/26/12) The minimum-security prison camp at Herlong, Calif., with bunks housing about 130 inmates in the building at left, is temporary home to Salt Lake City environmental activist Tim DeChristopher, who disrupted a federal Bureau of Land Management oil and gas lease sale by bidding on land tracts. 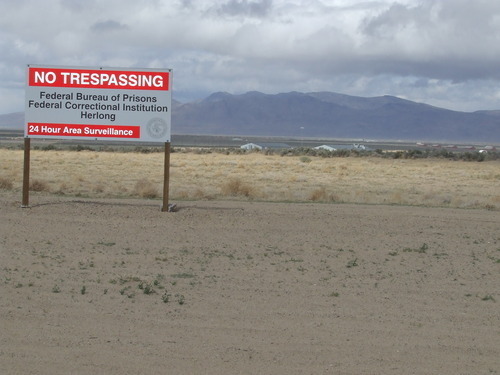 He is serving a two-year sentence at the camp northwest of Reno, Nev., and has routine access to short walks on the desert around the complex. Herlong, Calif. • The sand, grass and sagebrush roll out across the valley floor before him, rising through thin air to the olive-drab mountain waves. This is where Salt Lake City environmentalist and federal drilling mutineer Tim DeChristopher takes his evening strolls, no barbed wire on the horizon and no one really watching him because he knows running off turns a two-year sentence into seven. His section of Federal Correctional Institution Herlong truly is minimum security. It looks an awful lot like home turf, or at least the west desert basins where the West Virginia transplant first worked in Utah teaching outdoor and life skills to troubled kids. He routinely sees coyotes and jack rabbits on these walks and, from the window by his bunk, stunning sunsets. It's more or less a peaceful existence for this co-founder of the "climate-justice" group Peaceful Uprising, and he has used the past nine months largely for introspection, not activism, since U.S. District Judge Dee Benson sent him away last July. He wants to go to a seminary when he's out and become a Unitarian minister. While not changing the defiant tune that Benson said landed him here, he concedes he would rather be somewhere else. It gets boring. "I've just been doing my time here," he said last week in a face-to-face interview at the prison camp visiting room  a big room that looks like a bus station with rows of conjoined seats facing one another. Although it was an environmental stand that led him here, DeChristopher is just as incensed when talking about "corporate citizenship," such as that endorsed by a Supreme Court ruling opening the vault for untold corporate dollars in elections. He champions worker rights and "social justice," and, in fact, said he believes it's now too late for climate activism to thwart catastrophe. Best to ensure that poor people and nations don't bear most of the brunt. He's not pulling activist strings from prison, and he's not writing much but friendly letters. It doesn't mean, he noted, that he regrets anything or wouldn't  won't  do something like this again. "We do have the power to shape the country," he said, "but too often people act like consumers instead of citizens." That question of citizenship  and its relative definitions  is essentially how he got here. Before and during his trial in spring 2011, DeChristopher maintained it was necessary to stand against a federal oil- and gas-lease auction that he argued was illegal and rushed without necessary environmental review at the end of the George W. Bush administration. The incoming Obama team later pulled the leases for further review. Prosecutors said DeChristopher's brand of "citizenship" threatened the "rule of law." Jurors, some reluctantly, convicted him. Benson then told DeChristopher he likely wouldn't have faced prison had he stopped speaking out  as he did in a fiery post-conviction speech on the courthouse steps, where the activist urged supporters rallying on Main Street to follow his lead into civil disobedience against climate change. 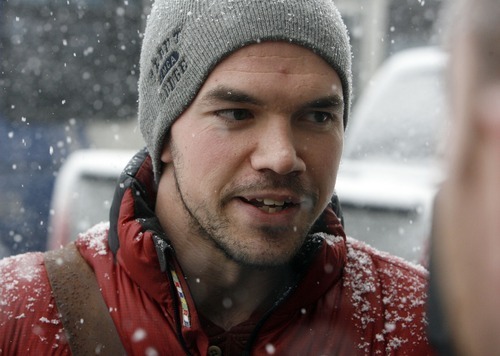 On that December day of the 2008 auction, DeChristopher had just finished a final exam at the University of Utah and joined protesters outside the Gateway office, where oil companies were waiting to bid for acreage. He went inside and observed the bidders until he noticed a friend from church, Krista Bowers, at the back of the room  crying. She would later say that watching companies win lands, some near national parks, for about $2 an acre made her feel helpless to protect the environment. DeChristopher became emboldened and began bidding. He ran up a tab of $1.8 million that he didn't have. He wouldn't necessarily choose another Bureau of Land Management auction, or even an environmental cause, but last week DeChristopher said he's young enough to risk prison again some day to advance social justice. Not during his probation after next April 21, when he's projected for release with good-time credits. But some day. "I don't think being a political prisoner is a failure of activism," he said. "It's a step along the path of activism." Bowers also calls her friend a "political prisoner," but said his letters are encouraging, and mostly ask how folks are doing back home. "He's been doing pretty well in there." That changed for three weeks in March, when an investigation into an email he sent to a Peaceful Uprising colleague led the warden to move him into isolated confinement at the nearby medium-security building. He stayed in a small cell with a roommate, and most days was never let out. DeChristopher later told his friends that the officer who moved him said it was because an unnamed congressman had requested the inquiry. The prison staff would make no comment about that. DeChristopher's friends rallied for his return to the relatively free movement of minimum security. That happened the next day. Ostensibly a congressman (all of Utah's delegation members have said it wasn't them) was angered at his threat to return a company's contribution to his legal defense and protest that company because he had heard it was moving jobs overseas. DeChristopher said last week he isn't sure what happened  the prison officer later told him it wasn't a congressman  but he's sure that the Bureau of Prisons counter-terrorism unit noticed his use of the word "threat." Pat Shea, one of DeChristopher's Salt Lake City attorneys, has visited Herlong twice: once while his client was in minimum security and once while in isolation. The latter time, Shea said, "he had a certain beady-eyed look, which I've noticed with prisoners when they're under stress." Shea has been trying unsuccessfully to arrange for DeChristopher to take a graduate school entry exam. "Maybe [his First Unitarian minister] Tom Goldsmith and I are pushing too hard," Shea said, "but we think Harvard Divinity School would be good for him, and he for it." DeChristopher said Utah is home, his "most connected community" after six years in the state, but he eventually would have to leave to attend a Unitarian seminary. He didn't know he could speak publicly and be effective until his ordeal, which made him a folk hero in the environmental movement and sent him on train rides around the country to bolster various causes. Ministering "is something that I would be good at," he said, "where I could use my skills." Church also seems the easiest place to nurture an activist spirit, he added, without bending to the desires of nonprofit donors. In minimum security, he lives in a row of ungated cubicles, two bunks to a cube. A TV  the first he's watched since his youth, just out of boredom  used to be visible from his bunk, but someone moved it down the row. The bunkhouse is a one-story cinder-block warehouse with corrugated steel ends. DeChristopher has frequent access to email at a shared computer, but only with a list of five approved correspondents. He gets letters regularly, hundreds from people he doesn't know. He used to write back to every one, 20 to 30 a week, but now can't keep up and still enjoy some personal time. No one, he said, has written to chide him. "They're all thanking me for what I'm doing." Normally, he would have restricted phone access, but right now he's serving a two-month suspension of the privilege. He said during one call he passed a message from his roommate to be relayed to a contact on the outside, which he hadn't realized was forbidden. People send him books and he gets several magazine subscriptions, including Mother Jones, The Economist, Harper's and The New Yorker. He shares articles with other inmates, some of whom show interest but can't replace his philosophical discussions with friends. Fellow inmates are mostly friendly and, he said, don't belong here. He's been reading up on how much the U.S. spends locking away people who aren't threats: Prison reform is a new social cause for him. Friends in Utah also send him relevant Salt Lake Tribune clippings, because he's unable to surf the Web for news. He doesn't get angry at the mention of Judge Benson. "He played his role," DeChristopher said, and "he saw his job as protecting the power structure." DeChristopher said he has gained a few pounds but lost fat. He does pull-ups and push-ups regularly (most everyone here does) but has no access to weights. The 30-year-old U. economics alum feels like he's in the best shape since high school. He makes $5.25 a month rinsing dishes and loading them into a washer twice a day. Peaceful Uprising continues protesting energy and other developments. Group co-founder Ashley Anderson said he misses his friend, their debates and strategy sessions, but the work goes on and DeChristopher is rightly taking time for himself. "I don't think he's a normal person," Anderson said. "His sort of stoic demeanor is well-suited to periods of quiet." Bowers said her friend's sacrifice  inspired by her tears  has moved her to take action. She was among a group of climate activists arrested last year at a Washington, D.C., protest of federal energy leases. "I had to," she said. "I didn't have a choice. I'm more inclined [now] to do things that could get me arrested." 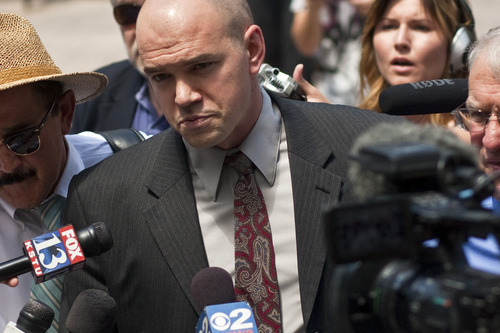 Lawyers for convicted eco-activist Tim DeChristopher will argue the fairness of his trial and conviction before the 10th U.S. Circuit Court of Appeals in Denver on Thursday. "Not that I think that's the only way to be effective, but I'm 30 years old. I've got a lot of time left. I'm sure somewhere along the way I'll have to make another stand." On what's for dinner: recently, barbecue pork, pinto beans, rice. "I really like the food, in general. It's not too bad." "I try not to have relationships with staff, or chitchat." All of the inmates learn to treat guards as "robots," or risk hurt feelings when they're treated in dehumanizing ways. "My mom was proud of me, and she's made that clear." Both parents visited from Colorado and were somewhat relieved to see the conditions. His dad, DeChristopher said, started out believing the judicial system works and that Tim shouldn't have messed with it. But DeChristopher said his father now questions the system a bit more.